To bring the action closer, experience the difference with Canon's compact and versatile 10x30 IS II. Whether looking at the feathers of a bird, the expression on a child's face as they run to catch a fly ball, or a row of skyscrapers across the river, these lightweight and portable binoculars are ideal for travel, bird watching, sports, concerts and much more. With 10x magnification and bright 30mm/1.18 in. objective lenses, these binoculars perform wonderfully both indoors and out. 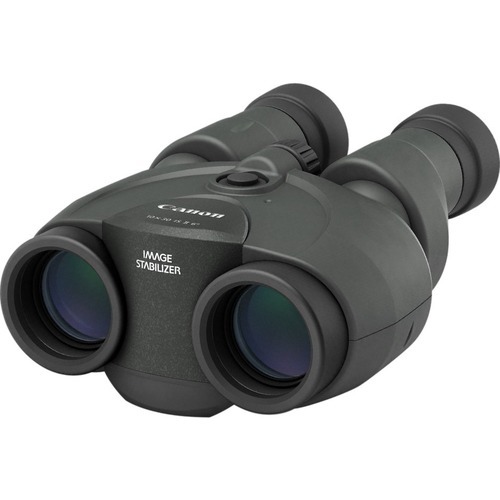 Featuring improved Canon Image Stabilization (IS) technology for smooth, extended viewing without the need for a tripod, these binoculars have Canon optics and corrective technology for sharp, colorful and bright, virtually distortion-free viewing. With all-day use in mind, the 10x30 IS II are designed to be comfortable even when wearing glasses. With an improved, low reflective exterior coating that helps minimize glare from the sun, they're less conspicuous when viewing wildlife, in the stands at a stadium or anywhere else where distracting reflections might occur. Energy efficient, with environmentally friendly-glass, these can be the perfect binoculars to bring along, everywhere.